Love this bed spread!! The cactus print is adorable. I don’t agree with other reviews in that the material is thin and see thru. I think it is perfect! I would definitely recommend! 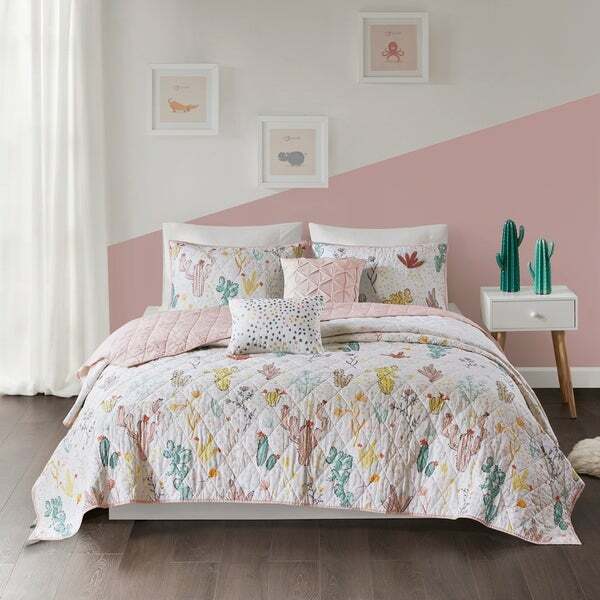 Sleep in a colorful oasis with the Urban Habitat Kids Cacti Cotton Printed Coverlet Set. Made from 100-percent cotton, the coverlet displays succulent and cacti motifs printed in soft, pastel colors for a charming look. A solid blush reverse adds a beautiful touch of color, while matching sham(s) echo the design of the coverlet. An oblong pillow with carpet embroidery and a square pillow with tufted manipulation provide the finishing touch to complement the bedding set. Machine washable for easy care, this cotton printed coverlet set will turn your bedroom into an inviting desert retreat. We have two coverlets from Garnet Hill that we love, and the quality of this one is absolutely just as good. Beautiful, washes easily, highly recommend! This set is adorable! I bought two for my daughters. It’s a really cute set for the transition from a kids room to a preteen room. Well made and looks just like the picture. I had to order this as a replacement for a different order that was abruptly canceled by Overstock. I love this set so much! It looks like a very expensive coverlet. I bought this for my daughter's daybed. It is good quality and the colors are pretty! It came with pillows, which are cute and fun. It was the finishing touch to our "cactus" theme bedroom. This is so cute! Bought it for my young daughter but I think it would work fine for young adults as well. I love the colors. Very satisfied with the product and the service. Received in a timely manner especially since it was ordered during the bysy Christmas season. Will definitely order from again. Super cute bedding. Perfect for my 4 year old and can transition with her as she gets older. My daughter loves the design for her room.